I have returned to full-time work after some time off, and my brain is a bit saggy when it comes to reading. I was reading a longer book, and the edition I had was a mass market paperback from the 1970s. The typesetting was tight and the font was flabby, and the story itself (which I will finish, I swear, etc.) centres around an incestuously connected rural community. The claustrophobia was overwhelming. 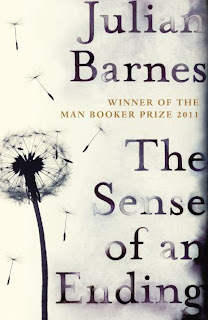 I picked up The Sense of an Ending, and it was just the perfect solace. Closer to a novella than a novel, and set openly in a calming, slender Bembo1, I felt comfortable here. Beyond the material aspects of the book, the story itself has a polar opposition to the tight knit rural aspect of the other2: The main characters have lives that touch and diverge, lives that interact in profound ways, but do not press up against each other. Tony Webster is a middle-age man, retired from a career of little consequence. He has a wife and a daughter in his past, both also marginally in the present. An unexpected and inexplicable inheritance sets off a chain of memory and re-figuring his history. The first section of the novel is his recollection of his friendship with Adrian Finn, an anomaly who joined his school clique. Adrian is extremely smart and much more self-possessed than the rest of the group. Webster's memory is unreliable and reconfigured, the ordering and timing of events from forty years previous is naturally gone. He remembers as we remember: incidents, particularly ones we revisit (and perhaps reauthor). Any sense of narrative can only be retrospective. The feelings of such replayed memories play rebalancing games, I think. There are the original perceptions from the time remembered, but with a younger mind, perceived with a blunt tool. Reversing the perceptions back into a reality with an adult mind (more mellowed and circumspect) produces distortions. "...as the witnesses to your life diminish, there is less corroboration, and therefore less certainty, as to what you are or have been." What happens then when we stumble upon artifacts and consequences from these times? When looking at an old photo, or reading an old letter, some shard of the reality is available for present day interrogation. The context is lost and distorted, and reconciling is jarring. Surely we can know something about our own past, but how much seems impossible to say. When Webster receives an unexpected letter from a solicitor, he begins a process of discovery. What had he really done? What were the consequences? How much could he ever learn about his own past? This is the sort of discovery we might all make, and that occasionally we crave. What became of an old friend? What were the consequences of the way I ended things with her? The world Tony seems to have created (but only now partially enters) is frankly a bit fantastic. His old girlfriend Veronica is extreme, Adrian Finn's actions were doubly or triply extreme, and so on. Barnes is mysterious with the plot: Webster clearly only deserves to know part of the story, and the author doesn't want to make the "truth" any more accessible to the reader. I wish Barnes had left the gaps in the motivations and sequences of the actions, rather than making the actions themselves so fantastical. Certainly it makes the truth inaccessible, but in a much less satisfying way. One of the many ideas here is that we don't live in our own wakes, consequences radiate off us and our awareness and understanding of them is necessarily incomplete. But here Tony simply appears to connect and incite unbalanced people. This novella won the 2011 Man Booker, and I find it hard to be too critical. Indeed it is fluidly and engagingly written. There are ideas here that grab the reader and distract from the paucity of depth and breadth; the ideas presented are baldly and sometime repetitively accessible. Nothing makes the reader work hard, but the mysteries of character create an illusion of narrative depth. This mystery also seems to imply complexity in the secondary characters without having to invest much time on them. Tony is a bit of a vacuum of a character, but fortunately the story and ideas require that. When I was finished, I wasn't sure whether this was excellence of craft or some form of cheating, or perhaps something more like a shortcut executed by an craftsman. Does he take us where we want to go efficiently, or are we only going on a trip of a couple of blocks? Thin, elegant, spare, immediate, unflabby and accessible. I was sucked in by the Bembo, and the text delivered on its promise. A promise of a literary experience in 10 easy steps, with a cola's balance of cold refreshment and warm nutty depth of flavour. This work captivated me and provided precisely what I was looking for, and I was burping away on the ideas joyfully for quite a while. Is it a great book? It shouldn't be required to be great, but perhaps winning Man Booker sets the expectations a tad too high. I am not an intense type geek, but I often will look for a note on the title verso about the typesetting. Bembo is one I always enjoy seeing. The other book is John Nichols' The Milagro Beanfield War. It is a little difficult book to understand considering I used to read Sidney Sheldon's and others.. This book is totally worth the Prize it received. The condition of the book was very good and hope to read more of the same genre. Four stars from a beginner.